It sure is here! I live in Texas and I’m tellin’ ya, it’s blazin’ hot here. We haven’t had much rain in what seems like months and all the poor farmer’s crops have all but burned up! I mean, there’s something seriously wrong when the weather forecast states “dangerous heat index, outdoor exposure should be limited. All that to say…it’s hot as heck here and I’m NOT cookin’ today! Well, maybe just a little bit. Salads are always a great option for hot days when it’s too hot to cook, but to be honest I get sick of salads sometimes. 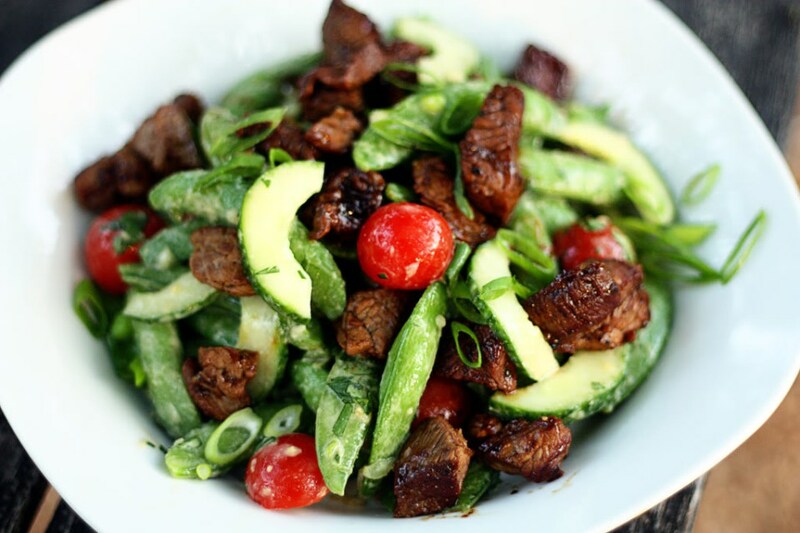 This Asian Sugar Snap Pea Steak Salad is something a little different, but definitely great and packed with flavor. To blanch peas: Bring a pan of water to a rolling boil. Place peas in boiling water for one minute. Remove with a slotted spoon to a bowl of ice water. Drain the peas when they are completely cold; set aside. In a medium bowl, combine soy sauce and next 8 ingredients (through sesame oil), stirring with a whisk. Add sugar snap peas, tomatoes, cucumber, and onions; toss to coat. Right before serving, heat a medium cast-iron skillet over high heat. Add olive oil to pan; swirl to coat. Combine steak, salt, and pepper, tossing to coat steak. Add steak mixture to pan; cook 5 minutes or until well browned and crisp, stirring frequently. When ready to serve, Combine peas, cucumbers, tomatoes, and green onion and toss to combine. Drizzle with dressing and toss until well coated. Divide into 4 portions and top with steak.